This is a normal development. White breaks the symmetry in order not to play into White a, Black b which is an ideal double-purpose play of pincer combined with extension. Now we expect a pincer to be played by Black in the right-hand corner. At c has been well explored, but d and e are played now. 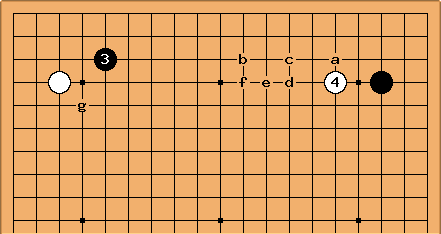 Yang Yilun recommends f (in How to Destroy and Preserve)...f is a dual purpose move serving as both a five space extension from and a pincer of . Thus f is urgent. In the background is the press at g for Black. In Edo period theory the high approach at wasn't yet widely played, so that the initial formation was generally avoided. Of course White could play out the left-hand corner instead, but the feeling is that an approach is a little more urgent. 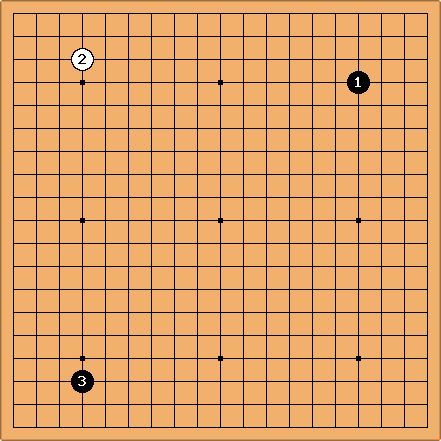 This is quite a popular diagonal fuseki in professional Go. 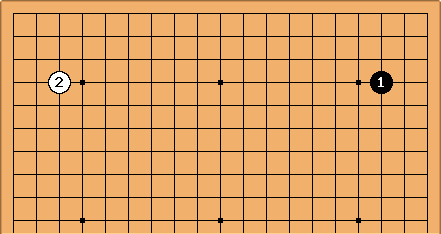 Black plays into mukai komoku on the theory that White will take the fourth corner, leaving Black with sente on the left side.